Submitted by mark on Sunday, December 10th, 2017 at 9:30 pm. Submitted by mark on Monday, November 13th, 2017 at 5:41 pm. Two Northland volunteer researchers are banding together to undertake a heritage inventory identifying places in Northland associated with World War II. Jack Kemp of Kerikeri and Dr Bill Guthrie of Doubtless Bay have had a long fascination with the strong military presence that was stationed in Northland during the conflict, and are undertaking an inventory of military camps and other sites before they are lost. “During the early 1940s there was a proliferation of military camps in Northland associated with the US Marines who were going to be sent to fight in the Pacific,” says Heritage New Zealand’s Northland Manager, Bill Edwards. Jack has been involved at Santo with the proposed WWII museum there, while Bill Guthrie is a former professor at the University of Macau whose Father-in-law was a bomber pilot at Guadalcanal and whose father served in the Medical Corps. Athough it’s still early days for the project, some of the initial research undertaken by Jack has already paid off. “We were recently advised of a new subdivision planned for west of Kamo near Whangarei. We cross-checked against information that had already been gathered on the area and it turns out that the subdivision will be built on the site of what was the C1 Marine camp,” he says. The two volunteers are starting with military camps, though the inventory is likely to expand to include other World War II sites in Northland including airfields, bunkers and gun emplacements. “The history of the Second World War is relatively recent, though in some ways that makes it all the more vulnerable to loss. We can’t take it for granted, and instead have to be proactive and record as much information as we can about this important part of our heritage,” says Bill. Anybody with any information about military bases in Northland during World War II, or other related information, can contact Bill Edwards on bedwards@heritage.org.nz or Ph 09-407-0471. Submitted by mark on Monday, November 13th, 2017 at 5:27 pm. Highwic’s Christmas Garden Festival (November 18-19) will offer something for everyone – and some great fun for children in particular. Best of all the Festival is free for everyone this year. The timeless charm of the annual spring garden extravaganza at Highwic – the historic mansion cared for by Heritage New Zealand in Newmarket – will serve as a backdrop to a number of attractions that will appeal to kids of all ages. “On the Saturday morning (November 18) we’ll kick off with our ‘Make a Christmas Garden’ competition for children. We’ll supply materials for kids to have a go at making a mini-garden, or if they prefer they can bring one they’ve made at home,” says the Manager of Highwic, Cheryl Laurie. Other entertainment will include performances by the Albany Ladies Choir on Saturday afternoon, a pipe band and Carols by Ukulele throughout Sunday. “The annual Highwic Christmas Garden Festival has become a ‘must attend’ for Auckland’s keen gardeners, and as always there will be plenty to interest growers,” says Cheryl. Highwic has also been working with the For The Love of Bees project, to become Auckland’s first inner city organic park. Festival goers will be able to see the beginnings of a pasture painting by Newmarket school in the orchard. These plantings of bee friendly plants will be food for the two beehives which will be installed in early November. Submitted by mark on Thursday, November 2nd, 2017 at 4:16 pm. Submitted by mark on Tuesday, October 3rd, 2017 at 4:42 am. One of Auckland’s much-loved historic places is joining the For the Love of Bees project and making plans to become the city’s first urban Organic Park. The aim will be to create a 1.1 hectare biological sanctuary for Auckland’s precious bee population. Apiculture New Zealand has declared September ‘Bee Aware Month’ – which couldn’t be better timing for the ambitious project according to Cheryl. “We’re excited that Newmarket Primary School students will be designing some ‘Pasture Paintings’ for Highwic in time for spring,” she says. The high point will be on October 27 when the bees will be formally welcomed at Highwic, and the students will sow seeds into the shapes they have created in the orchard, eventually providing sustenance for the bees during spring and summer. It will also be good advance prep for Highwic’s Christmas Garden Festival (November 18-19). “We’re looking forward to being part of the For the Love of Bees Project, and also partnering with the Tree Croppers Association on the orchard restoration project, and the Compost Collective in establishing Highwic as a compost hub,” says Cheryl. This collaboration is being supported by Parnell Rotary and and Enviroschools, Sustainable Schools and Auckland Council. The drawing together of community groups is a key factor in the For the Love of Bees project. Submitted by mark on Monday, October 2nd, 2017 at 3:09 pm. People wanting to learn about the heritage of the furthest reaches of the Far North can hop on a bus and explore the ‘top, top half’ of New Zealand in an exciting day trip. The ‘Ninety Mile Beach and Inland Excursion’ leaves Kaitaia at 9am on October 14 and returns 5-6pm. The Harrison’s chartered bus will drive up Ninety Mile Beach (a public highway) and explore some of the historic places of the area – including the Wagener homestead, the Waipapakauri Hotel with its colourful past, and the site of Norman ‘Wizard’ Smith’s shed – which once housed his world speed record breaking car Enterprise – and its connection to Charles Kingsford Smith’s sixth Trans-Tasman flight. The tour will be led by Heritage New Zealand’s Northland Manager Bill Edwards and other Northland staff who will talk about different aspects of the Far North’s history. The cost of the day-trip is $40 per person or $45 for non-Heritage Northland Inc members. Spaces are limited and bookings are essential with payment necessary by October 6. For more information phone Merle Newlove (09-439-7492) or Peter Williams (Ph 09-439-0822). Submitted by mark on Monday, July 24th, 2017 at 8:43 pm. One of the Bay of Islands’ favourite tourist destinations has won a Trip Advisor Certificate in Excellence. 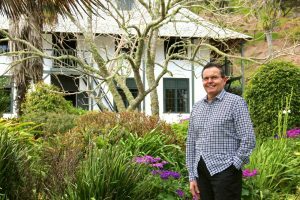 Pompallier Mission, the historic building in Russell which is cared for by Heritage New Zealand, is the recipient of the coveted award for the fourth year in a row. Only one percent of visitor attractions world-wide received the award this year. “I’m thrilled for the site, but most importantly I’m delighted for the Visitor Hosts who work here so tirelessly to deliver a great experience,” says the Manager of Pompallier Mission, Scott Elliffe. Submitted by mark on Monday, July 24th, 2017 at 8:36 pm. St Francis Xavier Catholic Church – now the Russell Chapel on the Olive Grove – is enjoying a second lease on life. "A historic Northland church that was deconsecrated and sold to private owners as a result of a dwindling congregation is enjoying a second life. 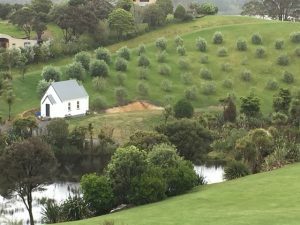 "St Francis Xavier Catholic Church, originally built in Kawakawa in 1875, was relocated to Uruti Bay near Russell in 2012 by Jo and Ross Blackman, and has been re-purposed as a wedding venue – now known as ‘Russell Chapel on the Olive Grove’.